Left to right – Tim Davies-Colley (Executive Project Manager – e-Learning Porirua), Vailogua Futi, Vai’s daughter and Foundation Trustee Wendy Betteridge at e-Learning’s Graduation 70 for Computers in Homes. As the 20/20 Trust’s Computers on Homes programme in its current form ends, we tell the stories of some of the 19,000 participants, and see the outcome of participation for them. My name is Vailogoua Futi, a mother of four kids, who migrated from Samoa in May 2016. It is a great pleasure to express my gratitude to the great support from this Computer Course to the families who are just starting to live in New Zealand like my family. When we just arrived in New Zealand in May this year, I found out that it was really hard for me and my kids to re-settle and to begin a new life here. We stayed with my sister and her family in McKillop Street for three months before we found our own house to move to. We are now staying at Cornwall Crescent, Cannons Creek as we moved there in August. Everything was settled after two weeks since we moved except for one thing which is a computer with internet to help with my kids’ homework. I felt so sorry for my three kids who are attending Windley School in Years 3, 7 and 8 because I knew that it was hard for them to catch up with the New Zealand system as every child has to use a computer but they didn’t have any experience in computer literacy. Not only that but it was also frustrating because we don’t have any computer or internet at home to help them to catch up. In the first week of October, I was so glad when I received a newsletter in the mail about the Computers in Homes Course. I couldn’t wait to contact the office and I was told to come to the RSA in McKillop Street to enrol and then to start the following week. I started this Computer Course on the 19th October 2016. I was feeling a bit nervous and unconfident when I just arrived and saw all these people like me already working on their own as I actually started in the second week of the Course. However, the lack of confidence that I had, slowly disappeared and I was feeling relaxed when I heard our Tutor, Tim’s calm voice and friendly face trying to introduce everyone and everything to us. The way he taught us was so helpful and easy to understand about computer literacy and different programs. Throughout the Computer Course, I became more confident and really enjoyed attending every week so that I wouldn’t miss out on any new thing Tim and Peter taught and shared with us about Computer Programs. This is the last week of this course and I have learnt a lot about computer literacy as well as a lot of new things which will be a great help to my kids especially my daughter who will attend Porirua College next Year. My kids are looking forward to learning a lot from their Mum when I finish this course so that I will share with them the knowledge and the skills that I’ve got, using the computer that I will pick up at the end of this course. Lastly, I would like to express deep sense of thanks and gratitude to the e-Learning Team for your time and the great work that you have done. Thank you for sharing your knowledge and skills to us parents in order to support our families and our future generations. Vailogoua is a recent graduate of the 20/20 Trust’s national Computers in Homes programme, managed and delivered in Porirua by e-Learning Porirua. Since 2000, the programme has helped more than 19,000 families build digital skills and confidence, connect to the internet and participate more fully in the digital world. The very first Computers in Homes school was Cannons Creek School in Porirua and e-Learning Porirua has been there from the start. 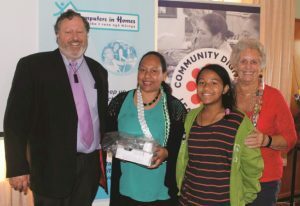 By 2011, 1,000 Porirua families had a hand-up from the project, in 2014 the total reached 1500, and e-Learning Porirua are approaching 2,000 families helped. In May 2016, the government advised that funding of the programme in its present form would not continue after 30 June 2017. (See New Zealand’s Digital Inclusion Challenge: Beyond Computers in Homes for how we in the 20/20 Trust have prepared for this transition and our view of the future for digital inclusion in New Zealand. We are continuing our discussions with government and others to secure funding for programmes that increase digital inclusion in digitally disadvantaged communities). Meanwhile, e-Learning Porirua see a continuing need for the programme in Porirua and, we understand, intend to carry on with their existing reserve funds and seek other funding. Visit e-Learning Porirua to read about their other projects, successes, awards and challenges.